The topics discussed in these various meetings have emphasised the value of encouraging the members to live this stage of their lives to the full, and it has become obvious at the same time that today the elderly members of populations everywhere take an active part as much in their communities as in the Church. Naturally this evolution is linked with the fact that the elderly the world over are living longer, and generally in better social and material conditions, which gives them years to play with in comparison with earlier generations. At the end of 2014 Marta Melo Atunes from Portugal, was elected as the new Life Ascending president for Europe. Monika Ptak is now the co-ordinator and Father Antonio Rego, again from Portugal, accepted the mission of spiritual advisor for Europe. During this meeting, two representatives from Poland came as observers. Fr Gregory Mashtaki has written his text for ‘The retired and aged association of St Augustine’ Title: ‘The elderly as agents of evangelisation in a multidenominational and a multicultural society’. Father Gregory’s reflection can be useful material for groups and will possibly form part of the preparation for the World Meeting in the Dominican Republic next year. A meeting took place in Katowice, in a house run by Caritas, Poland. 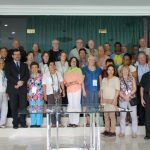 This meeting was attended by European Committee and Co-Ordinators for North and South America and Africa. This was in preparation for the next International Meeting. The pdf document gives a summary of the meeting, a brief account of main members attending and their countries. We are preparing a big event in Lourdes next June and have been working very hard on this project as we expect over 4000 people to attend. We recently published a newsletter entirely concerned to this event. Please find it here attached. Unfortunately it is only in French but I can tell you it will take place in Lourdes from 19h to 21st June, 2018. The general theme is : What are the main challenges for our world ? There will be conferences with famous guests, specialists in the proposed fields: journalists, priests, sociologists, philosophers..
Four themes will be developed « how can we live together ? 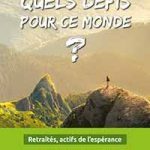 (considering the different religions present in France) » – « potentialities of the families today » « Health : getting old but in which conditions ? » and « Environment ». This is a big project for our movement. Besides, as VMI coordinator for Europe I am working on a website together with my colleague, the Belgian representative, Christian Liebenguth. A helpful document giving details of all continents in the Life Ascending movement, as well as the aims, ideals and outlining the practicalities of the movement can be read here. 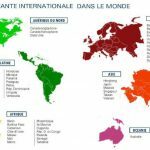 In September 2016, the European co-ordinating team set up a website – www.mcr.asso.fr The team would like to receive articles from the movement members in the different countries. If there is something you feel is worth sharing with our friends in Life Ascending in Europe then do share it through their website. Fr Jess Brena SJ communicated with Mrs Paula Conrad for many years during 1990’s, before setting up Life Ascending in the Far East. He is now at the forefront of the movement in the Philippines. “Life in all its stages is beautiful in addition to be a great gift of God, which deserves to be lived fully and joyfully. But as the author of this book repeats in many places, the Third Age has a particularly unique meaning. It cannot only be the crown of the other two Stages, but also should be a very rich source of happiness. Longevity is a great gift of the Creator to let us enjoy all the blessings we have received previously.” ã from the Prologue by + Paul Cardinal Shan, SJ. Ascending Life Canada is the English language version of La Vie Montante which is also alive and vibrant in Canada. Canada being a bilingual Country. While our Journal reaches coast to coast offering resource for Gatherings, we believe our greatest calling is to reach out to our forgotten seniors. Those who can no longer gather for various reasons. For many, receipt of our Journal by post or email is the only connection with people of Faith, they advise. Sometimes the only connection for the lonely. Outreach to the forgotten, lonely is of importance. We continue to seek them out and offer them the Word of God in this, the 3rd stage of life. Please pray for us on this endeavor. 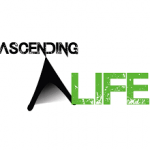 Ascending Life believes that as long as we live, we should move forward and onward to new horizons, new experiences and new growth of mind, heart and spirit. 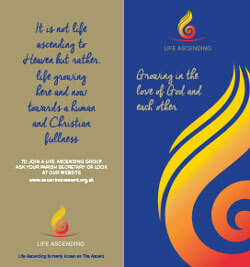 At our core is the essential element of spirituality; a call to prayer, reflection, study and faith sharing. The fruit of spirituality is service, witnessing to the teaching of Jesus, living this day-by-day. Bringing love and understanding to others, as well as prayerful support. Friendship is another fruit of spirituality, coming together and sharing at a deeper level, dreams, hopes, families, concerns, limitations, humanness and love of God. Attached find Resources for the above, which I hope you will find timely and inspirational. I will be forwarding Sunday gospel reflections for the month of May and June, mid April, then taking the Summer off and recommencing September. 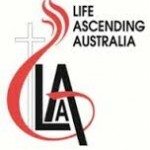 The movement was begun in Australia by Sr Patricia OP in October 1999 and it now has approximately 200 members mostly in Sydney though it is expanding to the Dioceses of Wollongong, Melbourne, Tasmania and Parramatta. An International Conference is held every four years at which delegates from the 80 member countries attend. The Australian delegates have been fortunate in attending three such conferences: Bangkok 2002, Lourdes 2006, and Quebec 2010. A special conference was held for leaders at Fatima (Portugal February 2012) The movement has Papal approval and belongs to the Pontifical Council of the Laity.